Pipe stands save wear and tear on machinery, reduce strain on operators and makes the fusion process easier. 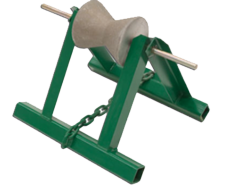 Pipe stands are adjustable for uneven terrain so that the pipe is supported at the same height as the machine. By bringing the pipe in parallel to the machine it is much easier to adjust hi/low and achieve a square face-off. When building a pipeline, pipe stands can greatly increase productivity. Instead of moving the machine for each joint, you would pull the fused pipe through the machine and roll in a new stick to be fused. This allows you to stage all the pipe in one location, and keep the fusion machine stationary, minimizing down time between fusion joints.